An "invasive species" is defined as a species that is: 1) non-native (or alient) to the ecosystem, and 2) whose introduction causes or is likely to cause harm to the economy, environment or human health (USDA NISIC). 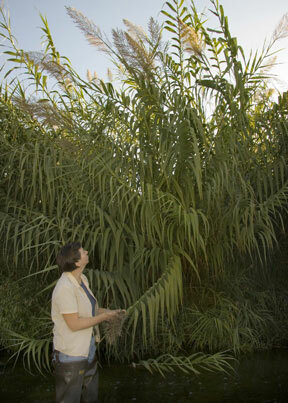 Invasive species can be plants, animals, fungi or microbes. Only a small subset of the exotic species that humans transport from one area to another is invasive. Often, harmful invasions are caused by species from a similar climate that travel well, grow and reproduce vigorously, and spread aggressively under local conditions. These organisms may cause harm by outcompeting, preying on or physically disrupting habitat for native species. While the variety of invasive species makes this difficult to quantify, it is thought that the U.S. spends approximately $120 billion annually to control and calculate the impacts of invasive species. For more information about the Santa Clara River Invasive Weeds Task Force, please visit http://ucanr.org/sites/SCRIWTF/. UC Cooperative Extension is involved in several programs to understand the ecology of, investigate control methods for and provide training to manage and prevent several aquatic invasive species, such as quagga mussels and New Zealand mudsnails. For more information on quagga and zebra mussels, please visit http://groups.ucanr.org/quagga/index.cfm. For more information on New Zealand mudsnails, please visit http://groups.ucanr.org/NZMS/. For more information on marine and freshwater species introduction through ballast water, please visit http://groups.ucanr.org/Ballast_Outreach/. Early Detection Monitoring Manual for Quagga and Zebra Mussels, California Sea Grant Extension Program and the University of California Cooperative Extension: Carolynn S. Culver, Ph.D., Sabrina Drill, Ph.D., Monique R. Myers, D.Env., Valerie T. Borel. Publication No. T-069.